If story were a drug, the short story would be a stronger and faster-acting dose of the novel. Short stories give you a quick dose of adventure when you only have twenty minutes, maybe forty minutes maximum, to entertain your spirit and expand your imagination. But just because you spend less words and minutes with the short story doesn’t mean it impacts your perception of people or reality less than longer content. The short story, when crafted well, buries itself in memory and goes on to affect the way you perceive the world for many years to come. The first nineteen years of my life, I limited the science fiction genre to giant reptile sea monsters and alien invasions. My perception changed thanks to a semester-long literary class focused solely on science fiction. I’ve since learned that sci-fi is used as a smoke screen to discuss sensitive or illegal topics. It’s used as a tool to explore the ramifications of our discoveries and how we use them. It’s even used to help prototype new inventions. I’ve continued to pursue the most mind-blowing, imagination-growing, heart-pounding stories in the genre. What meets this criteria? As with any good story, I want to be thrown into the action. Distract me from everything else going on in my world. I want to be in the story’s world. I want the setting to be believable, even if physics says its impossible. Give me reason to suspend disbelief. I want to feel like I’m spending time with real and complex characters. I want plot twists and surprising resolutions. Most of all, I want to see a universal truth represented in a unique and compelling way. Capture love, courage, integrity, consciousness, life, and truth in a situation or interaction I’ve never witnessed or imagined. 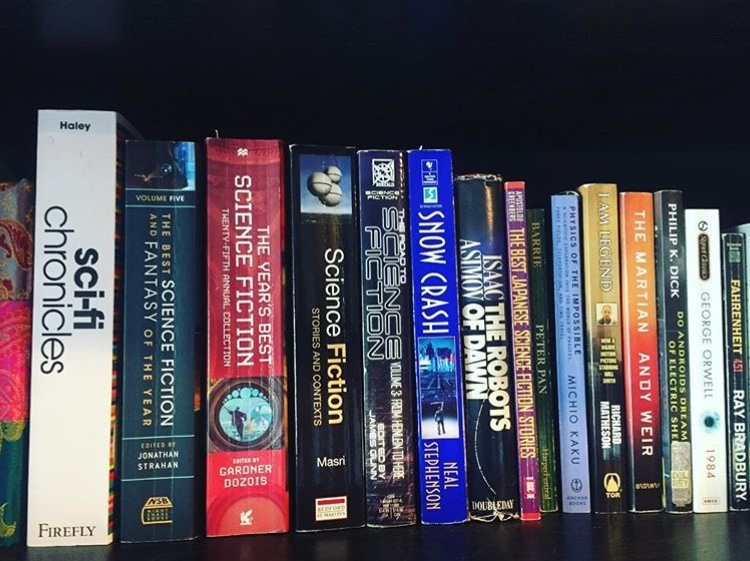 I’ve combined two of my favorite things — science fiction and short stories — and will be providing my favorites in following blog posts. NOTE: This page will be continually updated as I read more stories. Come back regularly for my top picks.